Candy Experiments: Candy Experiments 2 book launch! Candy Experiments 2 book launch! 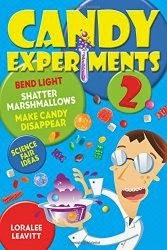 I'll be having a signing for Candy Experiments 2 at Barnes and Noble in Bellevue at 2:00 pm on Sat, Dec 6. Come check out my diving candy, warty licorice, and other eye-popping new experiments. Would love to see you there!